The 2019 seedling season is here! Pre-orders are open. Each spring, we offer over 200 varieties of organic vegetable and herb seedlings ready to grow in your garden. 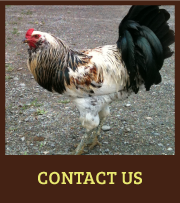 All of our seedlings are raised organically and certified by MOFGA in our State of Maine-licensed nursery. 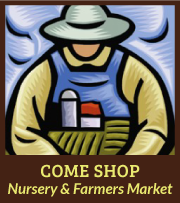 Come shop our plants at our on-farm nursery or at the Skowhegan Farmers Market. 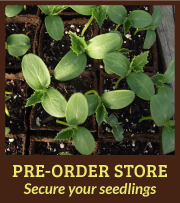 Or, reserve and secure your plants now using our NEW online Pre-Order store or by mail. Scientists around the world quest to understand the intricacy of living soil. 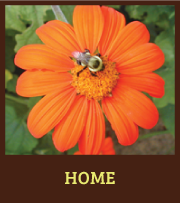 What we consistently learn from soil gurus, and observe on our own farm, is that living soil teeming with good bacteria, fungus, protozoa, invertebrates and essential inert compounds, is the most important element to a thriving garden. These critters are necessary to convert and relay the nutrients in the soil to the roots of the plant. 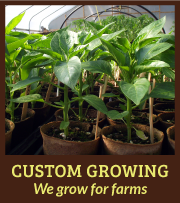 Our seedlings are wholly unlike those from large commercial sources grown in sterile medium and chemically fertilized. Seedlings from One Drop Farm hit the ground growing with the necessary agents for optimum organic nutrient uptake. Our seedlings are presented to our customers in a living medium. One Drop Farm is a small family farm growing an unmatched selection of over 200 varieties of organic vegetable and herb seedlings for gardeners and farmers in Maine and beyond. 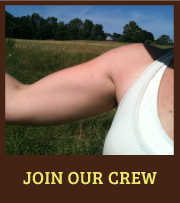 Owned and operated by Ann Mefferd, supported by her husband, Andrew, and their two tiny humans, Jasper and Cleome, we are located in the town of Cornville, just 5 miles north of Skowhegan in Central Maine.